Along these lines, I also thought January would be a good time for a little catching up on this blog. You see, I have blogged a lot this year. Lots and lots. You wouldn't believe how much I've blogged. 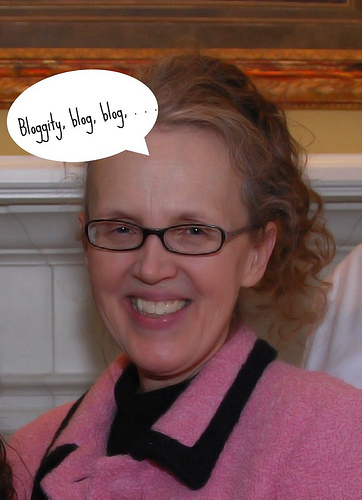 Why, I'm almost up there with The Pioneer Woman in the number of blog posts I've created! 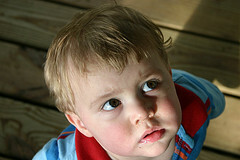 Why don't those posts show up on my blog? It's because they're in my head. So many pictures I can hardly organize them, so many great times, so many inspirations for posts. And I've written a bunch of them in my head. I just didn't get around to writing them down. Tim is a different story. He started a blog after I did. It's a private one, really a journal, a diary, if you will. I love reading it; it's a great record of what's going on in our life, and I'm able to see what he's been doing related to work. But, Tim operates differently than me. He gets things done - fast. He put a blog ap on his iphone. At the end of the day, he uploads pics he took that day with his phone, writes about his day, and posts. He keeps it simple and doesn't turn it into a big project. Me - I want to crop and enhance my photos, then write a story about an event. But, that takes time, and I'm a pretty busy gal, so I think, "Oh, I don't have time right now." And I never get around to it. Tim and I started fishing at the farm in early March. Nice largemouth bass in the pond below the house. 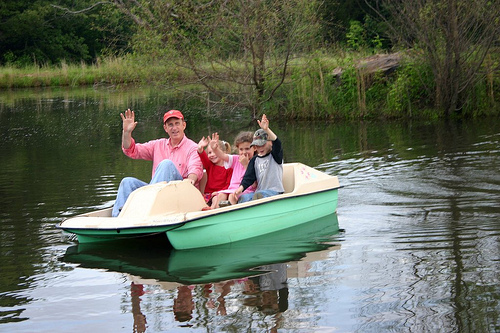 We bought a paddle boat from our neighbor and christened it "The Minnow Bucket." It was perfect for fishing in the pond, and Nick enjoyed coming along for the ride. My cousin, Joy, came for a visit, albeit a brief one, in April. For those of you who know Joel, Joy is his sister. Her mother was my mother's beloved baby sister, Devonna. 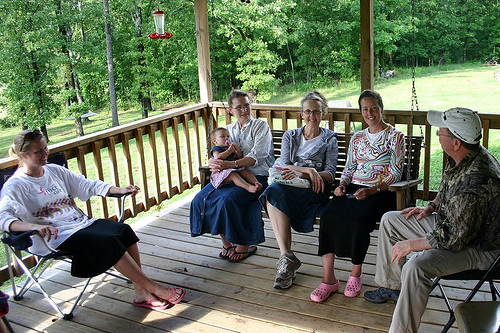 Joy plays the bass fiddle for the Sullivan Family, which is a gospel bluegrass group. 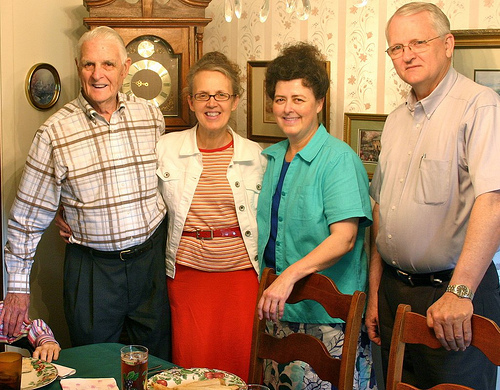 Pictured here with me are Enoch and Margie Sullivan, Joy, and Joel. It was so good to see Joy! I don't get to see her often, and it was a real treat to get together. 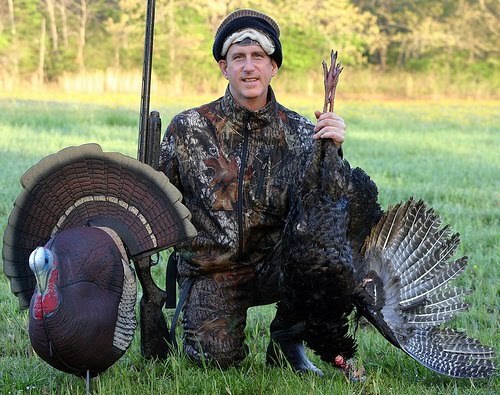 Spring is also the time for turkey hunting at the farm. 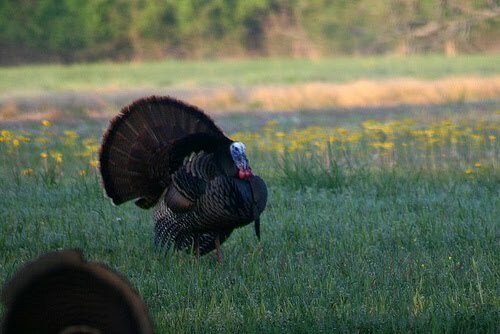 This gobbler was strutting his stuff. That's a decoy in the foreground. The gobbler wasn't strutting for long. Tim bagged him. My hunter looks pretty happy about that! Tim and I with Tim, Lauren, and baby Gabe in Tulsa in April. I might add here that John and I ordered so much food at the Cheesecake Factory that they couldn't get it all on our table. We ate most of it though! Rylie holding Gabe. In case you didn't know, these are two of my favorite kiddos in the whole, wide world! In May, Tim and I traveled to Magnolia, in south Arkansas, to celebrate my Uncle John's birthday. My sweet cousin, Jane, always goes all out with a pretty table and a special meal and birthday cake. 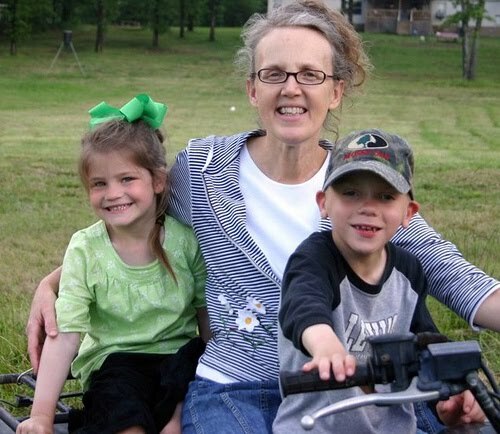 She and her husband, David, live near Uncle John and Aunt Ordell and are such a big help to him in caring for my precious aunt, pictured below with Jane and David's adorable grandaughter, Caitlyn. 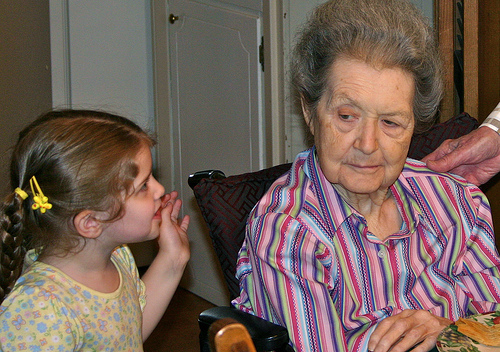 Aunt Ordell is my mother's only surviving sibling. She still has the same sweet spirit that she's always had. Memorial Day brought fun on the farm with friends. Fishin', four-wheelin', and food! Even little Ray-ray fished - and caught a bunch! Everyone who fished caught lots - and threw them back. Come on, Sterling! Reel it in! It just doesn't get any better than this! Tim and I love having friends at the farm. Now that was a post!!! I enjoyed looking at the pictures so much, but you know me, I am a picture nutt! Don't forget to post again soon. Thanks, Penny! I know you - you are a REAL photographer! I want you and your husband to come out to the farm this year. Haven't been fishing in years !!! Would love to come to the farm!!! Anonymous, thank you for taking the time to comment. I appreciate constructive criticism. It is not my desire or intent to attract a large following. This blog is simply a format for me to share stories and pictures about our life with family, friends, and anyone who might enjoy reading. Another purpose is to leave a record of family stories not only from the present but also those handed down from previous generations for the enjoyment of posterity.